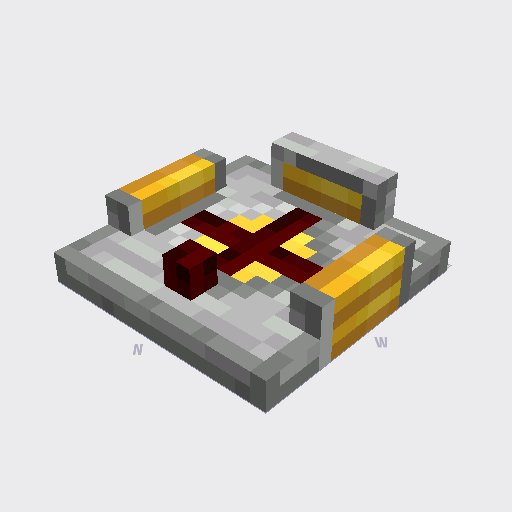 I thought i would share an idea for a new redstone component called an Evaluator. Does A contain any item/blocks types that match items/blocks that are placed in B & C? if yes output a full signal (15), if no output no signal. Signal is outputted on the north side of the block (indicated in the image). The output can be inverted with a toggle resulting in the below behavior. Does A contain any item/blocks types that match items/blocks that are placed in B & C? if yes output no signal, if no output a full signal (15). Signal is outputted on the north side of the block (indicated in the image). Does A contain any item/blocks types that match items/blocks that are placed in B & C? If no, output no signal. If yes, how much space do these blocks take up in the inventory as a percentage? Convert percentage into signal strength with 15 being 100%. In summary this would result in a signal of strength of 2. If the Evalutator is in inverted mode it would perform the same calculation as above and deduct it from 15. Using the same setup as above it would result in signal strength of 13. When checking items/blocks it does so using there name ID. The quantity of items won't affect the signal strength except if used with a Comparator. In this case only the quantities in the target chest (A) are taken into account as indicated above. An Evaluator can check for a target chest (A) up to 2 blocks away if a solid block is in between the target and the Evaluator. So that's it, let me know what you think. Would you find this item useful? is there anything you would change? The comparison / target terms need to be clarified: suggest that the Sample [the container to be checked] be tested against the Reference [the container against which this check is made]. I see the evauator (as depicted) as having a toggle that inverts the output, a single port for a reference (opposite the toggle), and two sample ports. What occurs if both sample ports are occupied? Suggest that this produce a #NULL or #ERR output. From what point can a compartor be used to take an output? Any unoccupied seems reasonable, but ought be explicitly stated. BUT, this leaves open the question of how to calculate the signal strength if less than full stacks were used in either (or both) sample and target. how would the output be calculated with 1 wheat in the sample and 64 in the reference? ........................................................with 64 wheat in the sample and 1 in the reference? what would the signal strength be? would this be a binary check (ie ON signal15 if any item in the sample matched any item in the reference, OFF signa0 otherwise)? if not, how would signal strength be determined? An alternative that might be easier to implement would be to test only a single item in the sample container, outputting a high (15) signal if it matched any item in the reference container, a low (7) signal if it did not, and a null (0) signal when the sample container was empty or held >1 item. These are some good questions so i'll try my best to answer them and hopefully clarify some of the functionality. Hopefully this clears things up and removes any confusion there may have been in regards to functionality. Let me know if this explains things better, if so ill update my original post. If you have any other questions or suggestions let me know. I wonder if comparison should be based on slots or items. Does the comparison take into account the number of items? For example, may I check if a chest contains more than 15 stone blocks? If there any (intended or fortuitous) side effects in having stackable items spread across several slots? I've updated the initial post to better explain the functionality. 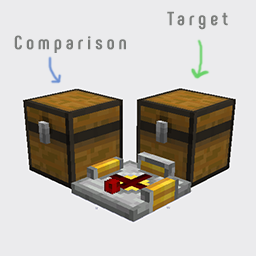 The initial concept won't compare the quantity of items, think of the comparison chests as black/white lists. Having multiple of the same item in them won't change the signal outputted. The good thing about them being inventory's, they could be changed without direct interaction from the player. It would be nice to have a way of checking for exact amounts of items but i feel it would complicate the blocks function. If you have any suggestions how it could work I'd like to hear it.